Hello from the RHDJapan blog and TGIF! The RHDJapan team will be celebrating our Bounenkai tonight and would like to give a big Kanpai to all who have supported us this year! There is still some time for those in a hurry for the end of the year. If you are in a rush, please remember to check the Holiday Schedule prior to placing your order. 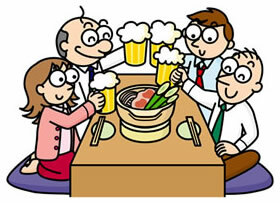 Bounenkai = Forget the year party, get as drunk as possible to selectively forget what you want from the year!! yatta!